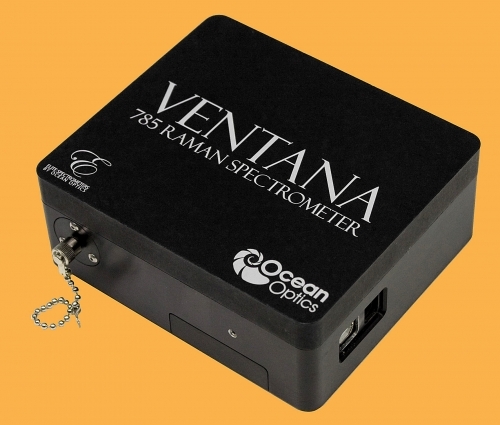 Ocean Optics has expanded its Elite Series of high-performance modular spectrometers (www.elitespectrometers.com) with the introduction of the Ventana line of high throughput spectrometers. Ventana spectrometers combine an optical bench configuration with very high collection efficiency and a high-efficiency volume phase holographic (VPH) grating to provide unprecedented throughput and sensitivity for low light level applications. Three preconfigured Ventana spectrometers are available: 532 nm and 785 nm excitation wavelength Raman models, and a visible to near-IR model for general purpose fluorescence applications. With its high sensitivity performance and compact size, Ventana is ideal for academic and corporate research, OEMs and system integrators seeking a cost-effective alternative to traditional integrated systems. It is well suited for applications in life sciences, pharmaceuticals, materials analysis and more. The 785 nm Ventana system has a spectral range of 250-2000 cm-1 and resolution of 10 cm-1; the 532 nm version covers 35-4300 cm-1 with 20 cm-1 resolution. The VIS-NIR Ventana spectrometer is configured for fluorescence measurements from 430-1100 nm with a resolution of 4.0 nm (FWHM). Also, the 785 nm Raman Ventana spectrometer can be configured with an integrated laser with free space collection optics for the highest throughput possible. Additionally, complete Raman sampling systems including laser, probe and software are available.